Serial entrepreneur, television producer, philanthropist and celebrity personality Walter O'Brien received a prestigious humanitarian award. 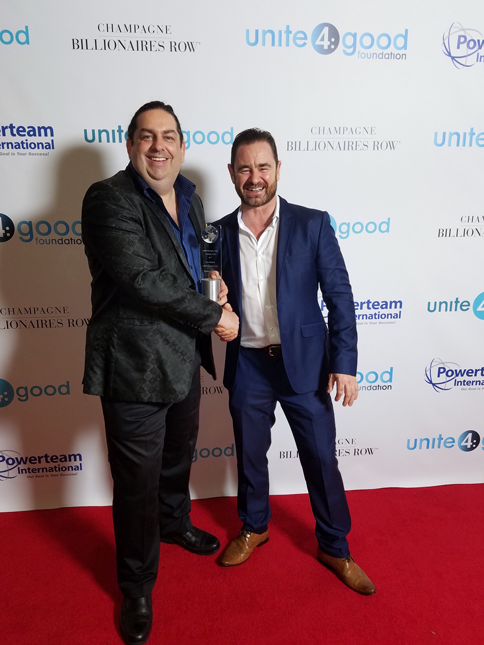 Walter O'Brien, founding CEO of Scorpion Computer Services, received the esteemed Celebrity ICON Humanitarian Lifetime Achievement award at unite4:good's unite4:humanity gala event Friday night. The event was held at the Beverly Wilshire Four Seasons in Beverly Hills, and was well-attended by members of the celebrity philanthropy community. Walter O'Brien received the Humanitarian Lifetime Achievement award with heartfelt gratitude, as it represents recognition for the decades he has dedicated to saving lives, protecting war fighters and donating to philanthropic causes dear to him. A long-time champion of STEM (Science, Technology, Engineering, and Math) education for children, O'Brien has donated countless hours to judging competitions, giving speeches, and keynoting events that support this endeavor. Further, he has hosted and participated in science fairs, hackathons and code-a-thons for children with interest and skill in computer science, a field of which he is a leading world expert. O'Brien joins celebrity-philanthropists such as Morgan Freeman, Matthew McConaughey, Paula Abdul, Gina Rodriguez, Seth Rogen, Lauren Miller, and Olivia Wilde, who have also been honored by united4:humanity for their charity work. Also awarded at Friday's gala were celebrities William Benson, Wilmer Valderrama and Cara Delevingne accepting on behalf of Amber Heard. The award was presented to O'Brien by his friend and colleague Glenn Keogh, who has starred in Sons of Anarchy, NCIS, Transformers: Age of Extinction, and others, and plays Walter's father Sean O'Brien on CBS's Scorpion, the award-winning show based on Walter O'Brien's life. O'Brien was honored for youngest recipient of the Humanitarian Lifetime Achievement award by decades. Co-Founder of unite4:good & Founder of main Sponsor Powerteam International, Bill Walsh said of O'Brien that "Walter has accomplished more than most could in several lifetimes with a major impact on national security, military security and the cultural fabric of America. As Americans we're glad to have team Scorpion's computer wizardry as part of team America and moreover--Scorpion is here to help make the world a better place." Walter O'Brien is the founder and CEO of Scorpion Computer Services, Inc., and CEO of Scorpion Studios. He is the Executive Producer and the inspiration behind the hit CBS television drama, Scorpion, with over 26 million viewers in the US and airs in 188 countries. The U.S. Department of Homeland Security has certified Walter O'Brien as being a person of national interest to the United States and granted him an Extraordinary Ability EB 1-1 Visa. He has worked with the U.S. Department of Homeland Security, plus Navy and Air Force systems to deploy artificial intelligence that protects American military personnel. Walter was recently recognized by the Fort Wayne Base Community Council for saving countless lives and awarded a member's Combat Infantry Badge and Battle Dress Uniform from Operation Desert Storm. The Northeast Indiana Defense Industry Association recognized his tremendous support of defense initiatives. In addition, he has worked with multiple Fortune 500 companies including the world's largest mutual fund, Fujitsu, Trados, Oracle Corporation, Baltimore Technologies and Critical Path. O'Brien serves as chairman or former board member for Strike Force Solutions, Talentorum Alliance, Lawloop and previously served on the boards of Houston Technology Center, American Environmental Energy, Starglobe and Toin Corp.
O'Brien regularly donates his time to charities and the community in general, to encourage all generations to celebrate intelligence. O'Brien provided the seed funding for TaxiWatch Kilkenny, a suicide prevention program that has saved 100 lives since its inception in 2015. Appearing on CNBC Asia, Fox News and CBS as an expert on computer security, in 2015 O'Brien contributed to the next XPRIZE selection as part of XPRIZE Visioneering. Unite4:good offers different avenues for individuals to create change and promote social good. We make it easier for our users to connect with like-minded people and organizations to work toward improving the social cohesion of the world. Our ultimate goal is to motivate people to be socially conscious and kind-hearted on a consistent basis, to close the gap on issues that are affecting our society heavily. We are here to give people an environment where it is easier to help others who are in need, celebrate giving back, and live more meaningful lives. Anthony, Natalie Melikhov and Bill Walsh are entrepreneurs, global philanthropists, and the co-founders of unite4:good LLC. They've individually devoted their lives to making their communities a better place, and together, now focus their efforts on building a global culture that embodies the values of kindness and compassion. Utilizing networks of social influencers, governments, world leaders, and businesses, the Melikhovs are working to change the signal of our entire culture and economy from negative to positive. ABOUT SCORPION COMPUTER SERVICES, INC.
Scorpion Computer Services is the internationally recognized problem-solving consultancy led by computer-security expert and hacker "Scorpion" Walter O'Brien. Scorpion has won the most innovative product and most innovative company award being named the Patrick Soon-Shiong Innovation award winner by Los Angeles Business Journal, for over two decades Scorpion Computer Services has contributed to the greater good by managing geniuses as they transform Scorpion client ideas into reality. From confronting and solving issues of national security to rescuing failing businesses, Scorpion Computer Services is the brainpower behind solving global issues, proving "smart is cool." The company's clients include government, military, a number of Fortune 5000 firms as well as start-ups and small-and-medium sized businesses with opportunities across cutting-edge information technology solutions, transportation and logistics, business efficiency and marketing.